Dental Implants Can Be More Affordable Than You Think! When a patient is missing one or more permanent teeth, Dr. Katarzyna Sekowska can restore their smile with dental implants. Dental implants are a modern solution to replace missing teeth; it consists of a titanium implant post and a dental restoration. To place a dental implant, our dentist will first surgically place the dental implant post in the bone socket of your missing tooth. During the healing period, which can take six to twelve weeks, your jawbone will grow around the dental implant post. This anchors the post in place and makes the dental implant a permanent part of your smile. A small connector post called an abutment is then attached to the implant post. Impressions of your teeth are made so a dental restoration can be constructed. When it is complete, the dental restoration is attached to the abutment. 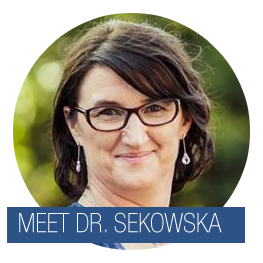 Dr. Katarzyna Sekowska is the dentist to see for a beautiful smile with a secure restoration. We welcome you to contact KS Dental Office today to learn more about dental implants and to schedule an appointment. Dental Implants look and feel like natural teeth, no one will ever know you ever lost a tooth! Modern Implants provide a lifetime solution for the problem of missing teeth.